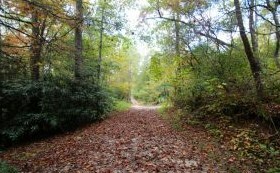 Nestled in the Western North Carolina mountains of Brevard this is a ideal hunting cabin or year round living, on 4 lots 51, 52, 53, & 56 with 2 additional lots that join 57 and 58. This lot already has a septic and is available for sale for 25K with a drive built and joins the 8K conservancy. This move in ready home and the community is surrounded by the new 8, 000 acre conservation easement and is close to the Gorgeous State Park. The home with 4 lots are almost level to gently rolling. You won't go wrong at this price for a great retreat! Located in scenic Western North Carolina, Brevard features the very best the area has to offer, from a relaxed, rural atmosphere to the conveniences of a modern city. Its pleasant, unhurried small-town environment is rich in natural beauty, cultural heritage, and social amenities. Brevard's close proximity and easy access to major metropolitan areas like Asheville, Charlotte, Greenville and Atlanta make it an ideal place to live. Known as "The Land of the Waterfalls" a name derived from the many waterfalls in the nearby Pisgah National Forest, Brevard is a nature lover's paradise. State and National forests cover more than one-third of Transylvania County, providing endless possibilities for hiking, backpacking, camping, and rock climbing. The French Broad and Davidson Rivers are popular for fishing, kayaking, canoeing and tubing. It's this combination of rural natural scenic beauty and urban convenience that make Brevard such a special place to live. The world renowned Brevard Music Center, home to outstanding guest musicians and artists during the summer months, offers concerts several times during the week. Numerous festivals fill Brevard's streets throughout the year, contributing to the sense of community that is so evident in this unique mountain town.